These were perfect with a cup of tea, and made great after school snacks too. Thanks so much to Diane F for sharing her recipe! Be sure to go and see what the rest of the #BakingBloggers made this month by clicking the links down at the bottom of the post. In a bowl, combine the flour, sugar, baking powder and salt. Cut in butter until the mixture resembles coarse crumbs. In a small bowl, combine egg and cream; stir into dry ingredients just until moistened. Fold in chocolate chips. Turn onto a floured surface; knead gently 6-8 times. Pat into a 6-in. circle. Cut dough into 6 wedges. Separate wedges and place 1 in. on an ungreased baking sheet. Bake at 350° for 18-20 minutes or until golden brown. Remove from pan to a wire rack. Serve warm. These scones looks so perfect! I can't believe I have yet to see the Great British Bake Off! I know it's pretty wonderful. I usually pop on an episode while I fold laundry :) I always learn something every episode. They sound wonderful and I'm always happy when I can find a recipe to help me clean out the cupboards. I am probably one of the few on the planet who has not seen one episode of the Great British Bake Off - well those of us in the foodie planet. Regardless, your scones look perfect and I am sure tasted absolutely delicious! I love it because they're so supportive of each other, not like American competition shows. These scones really make me wish my blackberry ones had turned out...I have a big ol' sad face just thinking about them! These just look so perfect! I'm hoping to try them with blackberries this summer, we've got 3 bushes now, putting three more in. We've got blueberries too, which I also think would be great. Scones were one of the things we made the most when I was a child, and they are still a favorite. And easy, as you say. These look great. So easy! I wish I hadn't waited so long to try them! I really need to watch the Great British Bake Off. 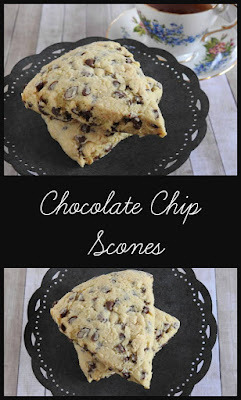 I've had scones on my radar to make and I think these chocolate chip ones are it! The Great British Baking Show is one of my husband and my favorite shows. We have watched every episode, and I try many of the recipes. These scones are the best. I make them at least once a month. I substitute the whipping cream with sour cream, and also add dried crancherries. Beautiful scones, what a great idea to finish the staples from your pantry first. I love scones and have made them with dried fruits and with nuts, but never thought of putting chocolate chips in. Great idea.